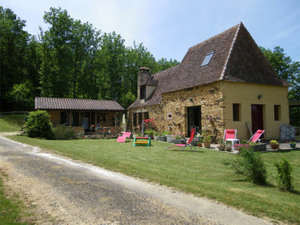 1st, "La péprigourdine" XVIII century rebuilt, 2 bedrooms with private shower-rooms and toilett - large living room with chimney (insert) - Great kitchen dining room - 2 rooms with room of water independent and WC, terrace, surface of carpark. 3 bedrooms in a cottage from XVIII reniewed with all confort - rental from september to june - each bedroom with private shower room and toiletts. possibility to have à cupboard and a frige in the family kitchen for preparing "pique-nique" or meals to be taken at home. bedrooms are equipped: TV, TNT, DVD, free access Internet. Maximum capacity: 7 people with add.beds or baby's bed.